Recent events in the news, including the current administration's attempts to ban travelers from certain countries and plans to build a wall on the U.S. border have highlighted attempts to keep terrorists from entering the country. 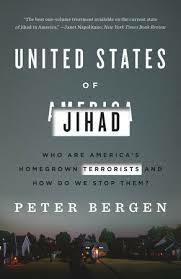 The book United States of Jihad takes a look at a much more unsettling phenomenon: the people who are already in the country who are plotting and carrying out terrorist activities. The disturbing fact that American citizens would align themselves with terrorist organizations (either formally joining or attempting to attach their names to a cause through violent activities) is something that is difficult for most people to comprehend. The author, a national security analyst for CNN, has come up with a number of factors that home-grown terrorists seem to share. These include being upset by US foreign actions in Muslim countries, having a "cognitive opening" to the ideas of radical Islam (usually preceded by a personal loss or disappointment), and looking for a sense of purpose through joining a large group. Citing examples such as Anwar al-Awlaki, an American-born cleric who had contact with many people who later carried out terrorist attacks, the author notes how the rise of the Internet has allowed the message of terrorist leaders and recruiters to reach more people than ever. al-Awlaki used the Internet to distribute his lectures throughout the world, and even to chat with followers on his personal blog when he was in hiding in Yemen. The ability of "lone wolf" type attackers to gain inspiration for their "missions" from online sources makes the job of law enforcement that much more difficult. The book also discusses the backgrounds and progress to radicalization for people involved in some well-known attacks, such as the Fort Hood shooting and the Boston Marathon bombing. The recruitment techniques and "path to paradise" promised to impressionable young people are detailed in the book. The war in Syria has also provided many recruits with an easy way to join ISIS: through Istanbul. While attempting to join ISIS campaigns in Afghanistan, Pakistan or Iraq proved too complicated for many, entering Syria via Turkey has been a much easier path. Additionally, those who train with ISIS in Syria are easily able to travel back to Europe, where they may commit terrorist attacks. Since the 9/11 attacks, however, ISIS or Taliban inspired attackers in the US have been lone wolf attackers who aspire to be a part of something big. These individual attackers, while hard to detect and intercept, are also unlikely to be able to carry out a mass event like 9/11 again, according to the author. As well as governmental attempts to track and stop potential terrorists in the US, several people are speaking out about the terrorists using Islam as a justification for their atrocities. Nader Hassan, cousin of the Fort Hood shooter, and Kerry Cahill, whose father died in the attack, have joined forces at the Nawal Foundation to denounce violence and terrorist. It is hoped that as they spread their message of acceptance and understanding, it will eventually drown out the voices of hate and violence.